Israel's National Bird Winner Is…. The winner is going to be announced at the end of the week in a special ceremony by President Peres (himself a well-known bird watcher, according to media reports). But we are able to tell you, hot from the Green Prophet aviary, that of those who voted in our special Green Prophet Poll, the majority want the Hoopoe (Duchifat in Hebrew) (pictured above in all its glory) to be Israel’s National Bird. Good luck with that, and let’s see which feathered beauty the entire nation favours. But there is an extremely serious side to this exercise: getting greater respect for and understanding the habits of birds amongst the human population. As we know, Israel’s Jordan Valley is a major migration route for all types of birds, and yet humans denude the landscape, drain and foul the water, all in the name of agriculture and recreation, and often, just plain ignorance. According to a recent report, which was released by the SPNI at the Jerusalem Environment & Nature Conference recently (which you can read about here), one-quarter of local nesting birds are in danger of various levels of threats, including extinction. The report, co-authored by Dan Alon (who was instrumental, along with Yossi Leshem, in initiating the National Bird Poll), says that 21 species are threatened, while only 2 species have seen their habitat and situation improve. Of the birds, which sadly but ironically includes the Hoopoe, it is the desert-dwellers that face the greatest upheaval due to an increase in agri-development in the Negev. The report states baldly that 18 species will ‘probably disappear’ unless immediate effects are made to protect them. Several of the larger local birds are amongst those threatened: only a few pairs of Golden Eagles remain (in the state of Israel & the Palestinian Territories). The Vulture population in the Golan and Galillee has suffered from deliberate and agricultural poisoning, and there is a steep decline from 150 to about 50 pairs of Egyptian Vultures over the past 20 years. The authors of the report recommend steps to prevent birds being electrocuted by high cables and power plants, and a greater effort (with Government monitoring) to use less hazardous chemicals in agriculture (could this be the Nationwide trigger to go organic? Green Prophet certainly hopes so). Other recommendations include protecting nesting sites from unsuspecting hikers and military training. And sadly the good people at the Bird Observatory/Bird Ringing Station near the Knesset confirmed the mauled bird I found recently in the Katamon area of the Capital (which had a numbered ring on), was a Bulbul. So Bulbul’s zero, Jerusalem’s street cats 1.
vielen danke fur das post, Rungholt, aber Green Prophet sich auf English! 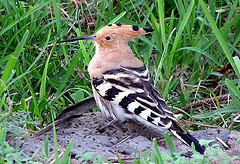 The winner is the hoopoe. Yippee!